Writing is perhaps an art. But how about reading, you might ask, as i do doubt this morning. It is indeed difficult to predict the total outcomes as to how they are possibly received with recipients than it is in ways we can easily make guesses about matters in bringing them together to our writings for their being to appear to have been made more sense to us. 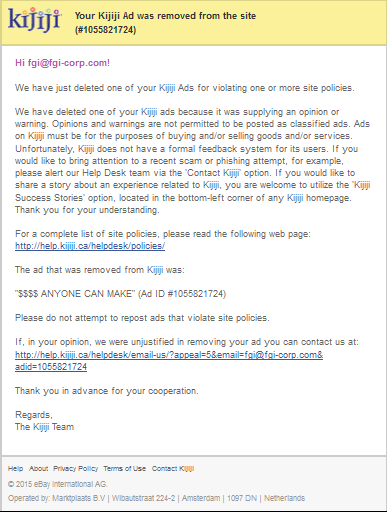 This morning I received an email notice from Kijiji indicating "We have just deleted one of your Kijiji Ads for violating one or more site policies." This had been now an ad of for a some while consisting of more than a 10,000 hits until today. Agreeably, however, a higher number of hits for an ad, like in here, doesn't necessarily mean to be translated for something as if it weren't dull to read. Certainly some ads may be a bit disturbing (or annoying, so to speak) in the sense for having them in their overly repeating display manners or with their excess contents whereas there is only a very few ads exists in public domain. And, we can in principle no doubt agree that posters must have at least some guesses, using the common sense knowledge, as to what posters want to say and how the ads are to be likely read. Not a joke. And it is not a corporate ad for a scam. Purchased and put it back into the full operation of all the suites in the summer of 1995 alone, with very little trades-skill actually (or problem-solving skills)--so anyone can do it. Since then really not much of anything for the owner to do more, went on to register as a fulltime time student in University of Winnipeg for the fall/winter 1995 but with an additional income already boosted of totaling about $100,000/year on the side--anyone can do it. While the free market economy of that time could only guarantee $5.50/hour for student population of Canadian to those who seeked job opportunities also, this was one of a kind of achievement of Canadian for their hunting skills on anyone-can-do-it opportunities at that time. Even today--the best location at Isabel for surroundeth renters, number of good suites for quick move-in or rental, and a simple way to live free and to have a job or hobby for even 50K+. With some extra works, this could be a much better apartment than many new apt blocks. The first rent is free to set once the new rental permit is obtained. 1-bedroom suite can go for $800 as well, but even with the low rents of $400 to a bachelor suite and $500 to a 1-bedroom suite, it should still do at least $50,000 net income as usual. Open for swap/trade deals--but this apartment is in comfort location (the entire front site from Tim Hortons to the bridge top at Dufferin is in fantastic look now, and only this apartment and the 215 Isabel project is for the other site)--so a swap/trade deal match something reasonable. 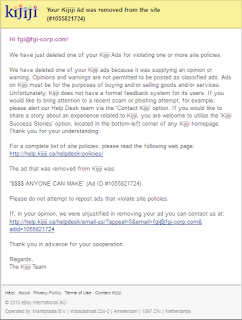 There might still be a case yet, as oppose to what i think of something as at most important to let younger population to know of the opportunities available, as Kijiji sees, that many readers may instead find this ad as a bit of annoying to read. Maybe true. Yet the fun part here is that this was actually of something asked by Kijiji the other day, for me to do, and of which occurrence be not that long ago--just a day ago narrowly. Then this sounds like also of something like not only asking a sleeping person to wake up and come for a street fight but laying the charge on the person at the same time just for a fun even after the person has been beaten up as planed. There could be no correlation however in this analogy as it may at its first sight--readership might have been dull or worse on a particular day, certainly. Then--'it is NOT all about your writing'.